Interestingly, on that same date the Freedom Tower – also known asOne World Trade Center – surpassed the height of the Empire State Building, thus restoring the World Trade Center as the tallest building in New York. 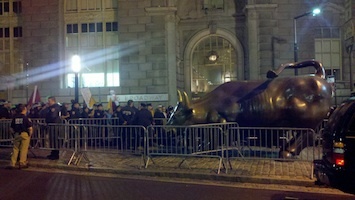 The protest passed within one block of the Freedom Tower. The stark temporal and spatial juxtaposition of these two events made me ponder some of the paradoxical aspects of our society, and provided a sharp example of the distinction between systems that are complicatedand systems that are complex. Erecting the tallest building in New York is complicated – thousands of people cooperating to assemble millions of parts in an act of defiance to the laws of physics. However, the only kinds of spontaneous, unplanned outcomes might be the project running over schedule or over budget: the shape, height, and functionality of the building are pre-determined and executed according to a carefully orchestrated, centralized plan. If one part is defective, it can be replaced with another part and construction can proceed; if laborers fall ill or go on strike, the project may be delayed, but it will still be completed. In contrast, a protest is largely – if not entirely – the emergent result of some simple instructions followed by individual activities, coordinated only through interactions with other individuals and with the environment. At a higher level, the general discontent that leads people to march in protest, is itself the emergent result of a complex web of events, opinions and communications, with no central director or orchestrator. And moving our viewpoint even higher, the task of “managing” an entire society, trying to keep people satisfied while maintaining a stable economy and a healthy population, is a frightfully complex and daunting task. And even though controlling a protest may seem “simple” compared to running a country, the outcome of a protest is difficult to predict and can vary dramatically, unlike the process of constructing a building like the Freedom Tower: while the march in New York remained relatively peaceful, similar marches in other parts of the country were less orderly. In Seattle, for example, the May Day march was marred by some acts of violence and vandalism. Often times with these types of events a small triggering event can lead to a dramatic change in outcome. One of the most elusive aspects of complex systems such as a protest, is that it is very difficult to judge what interventions might be effective in achieving desired outcomes. In New York, for instance, massive amounts of police accompanied the parade. Coupled with the use of barriers and careful control of pedestrian traffic, the result was a relatively orderly march. However, as I walked along Broadway watching the scene, I couldn’t help but feel as if the orderliness of the protest was a very delicate balancing act. I have witnessed protests where a small triggering incident suddenly turned a peaceful march into mayhem. And we have all seen pictures and videos of stampedes, where barriers can become deadly traps. 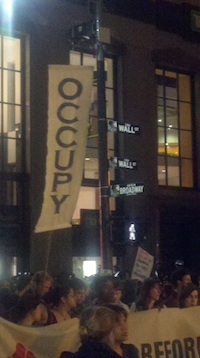 Thankfully, this particular protest remained peaceful.